Photos do not capture the sky, or the wonder that it can induce. This is a new blog, and that's the first thing I wanted to say. It may bear repeating later on. I took the photo above a few hours ago, from the roof of the three-story apartment building where I live with my wife Dess. Three bodies are setting over the Manhattan skyline as seen from Greenpoint, Brooklyn: Venus on the left, Jupiter on the right, and the moon in between. Venus is currently 102 million miles from the earth, and it's about the size of our own planet. The sun, which always sits around 93 million miles from earth, is to the lower right, having set below the horizon 48 minutes before I snapped the photo. Jupiter, a planet with a diameter a dozen times greater than that of Venus, is neverthless more faint due to its great distance from earth, currently 580 million miles. At this time it is sitting on the other side of the sun from us. Our moon, the smallest of all these objects but by far the brightest, is just 245, 000 miles distant. A little over three days ago it stood almost exactly between us and the sun (new moon phase), and tonight only 10% of its face had become illuminated. Above, a shot just two minutes later, at 8:10 pm. That's the Williamsburg bridge in front of Manhattan. The spiral-topped building near the right edge of the photo is the Woolworth Building, at 792 feet once the tallest building in the world (from 1913 to 1928). Not quite discernible in front of it is the spiral tower of the Municipal Building at 1 Centre Street. Set off to the right of both is a smaller building, the U.S. Court House at 40 Centre Street, which later swallowed up Jupiter; click the photo for more detail and you should be able to see its pyramid top. Above, a shot at 8:15. 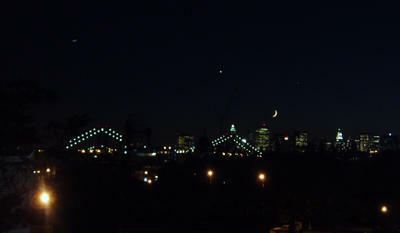 The very bright spot above the left-most tower of the bridge is an airplane, probably heading north to LaGuardia. Finally, a shot of the moon at 8:21. It disappeared within a minute. Jupiter disappeared at 8:31 behind the spiral top of the Woolworth Building, and re-emerged to the right of that spiral top before disappearing for good at 8:35 -- as mentioned, behind the pyramid top of the U.S. Court House. 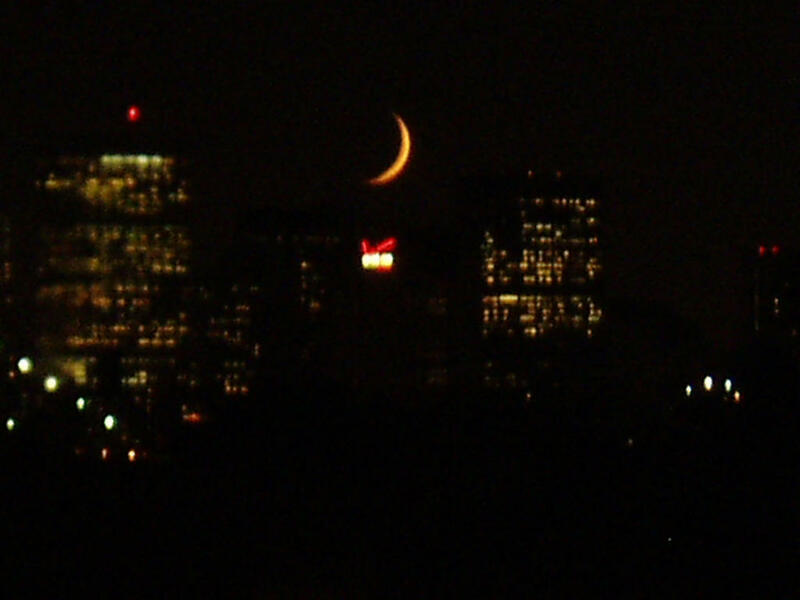 Venus disappeared at 8:37 behind the short flat-topped building sitting just to the left of the moon; we can see virtually no office lights within, and only a dull silhouette of the outline is visible. Looking at Venus through 9x63 binoculars, the planet took a few seconds to wink out, flashing wildly as it did so. In fact it flashed blue in the last instant, when only its topmost portion was visible. I wonder if this is at all similar to the "green flash," a rarely seen effect that happens when the topmost portion of the setting sun flashes green for just an instant. See Fred Schaaf's article "Catch the Green Flash" in the September/October 2005 issue of Night Sky magazine. And see the November/December issue of Night Sky for one of my photos, which will appear under the title, "Morning Moon Conjunction." I can remember only a few times when the sky has startled me quite like it did tonight. The feeling is not captured here. But I tell you what, even poor photos can witness to one essential fact: the sights in them do happen, and are not to be missed. For all those who did not know that New York skies produced such sights, or for anyone who enjoys the sky: go out and look west tomorrow (Wednesday). 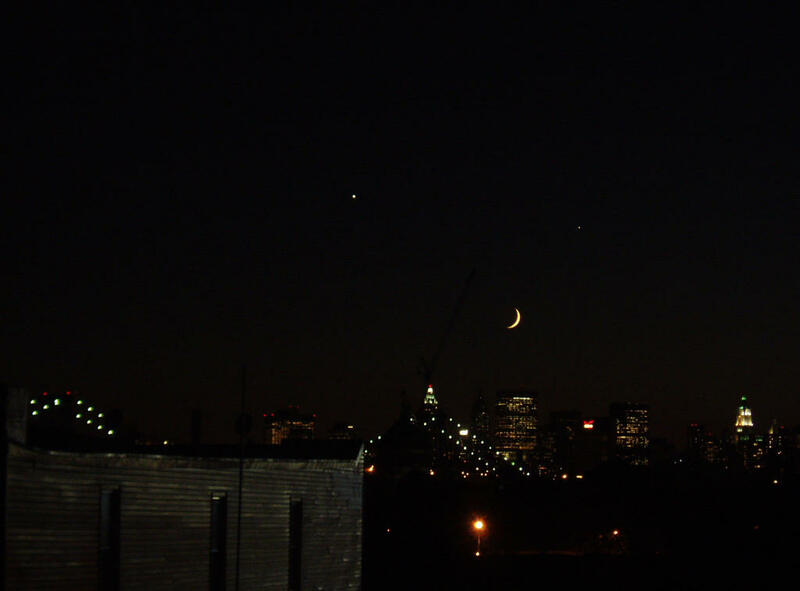 The moon will have moved across a large portion of the sky, and from left to right you will see the moon, Venus, and Jupiter in a virtually straight line, about equally distant from one another. Have a look, and take a picture. The Bad Astronomer sent me to check out your photos, which are just great. 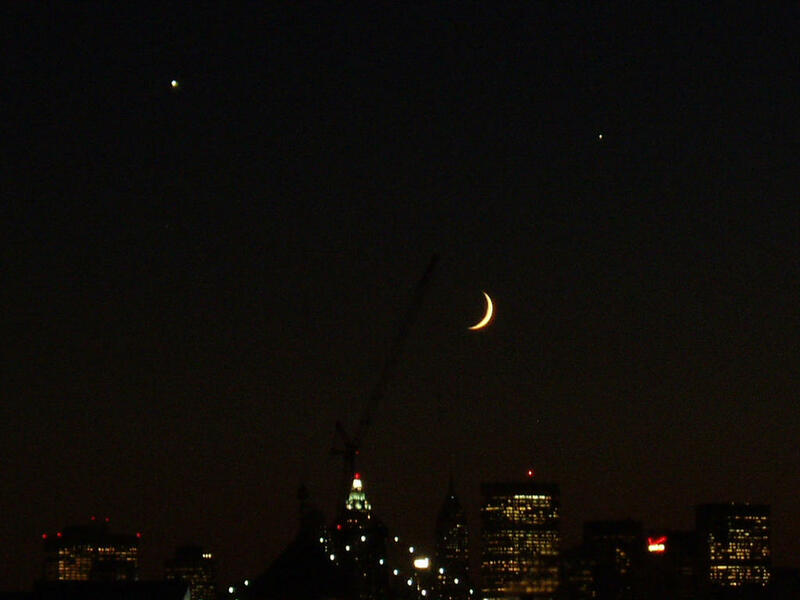 Seeing the moon, Venus and Jupiter juxtaposed with the NY skyline is pretty amazing to someone from the other side of the planet! I hope you took a look at my blog for an upside-down view of the same thing.